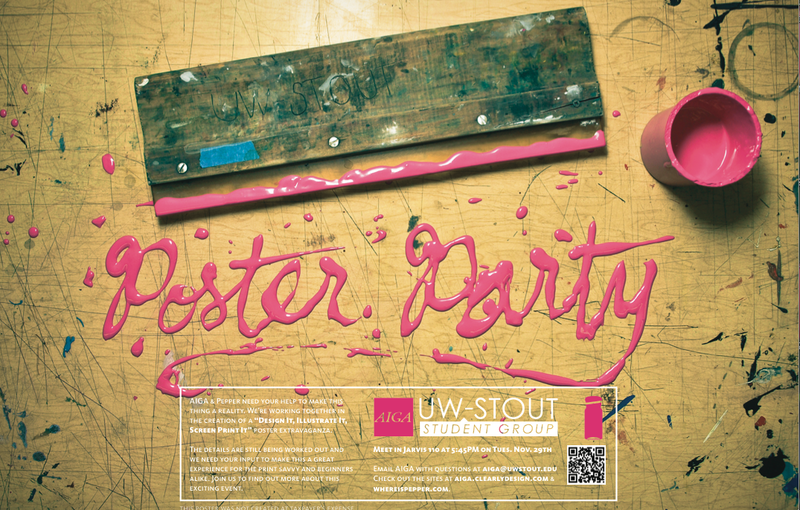 Come learn about designing posters for our party! 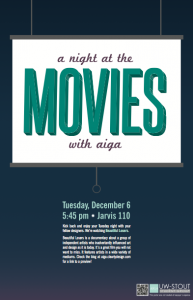 Come join us tonight. 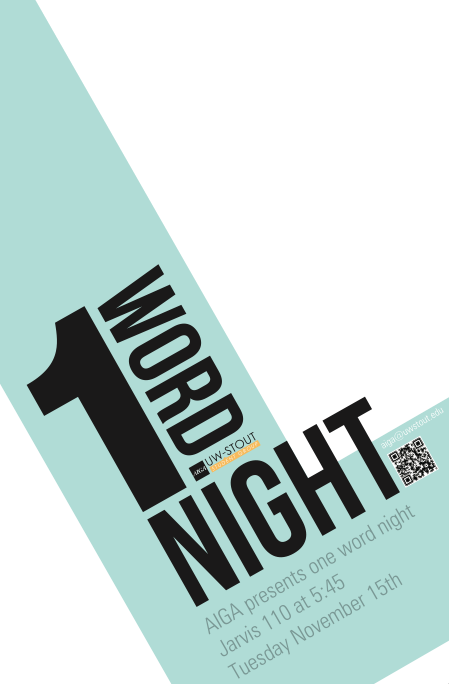 We are taking a word and designing anything around that word. Then at the end will show what we all came up with. Take a break and design stuff that won’t be graded. Last meeting we talked about font and file organization and board members went through a few of their preferred methods to keeping their computers organized and making sure files are archived in an effective manner. Ashley talked about saving inspiration and showed us how to export (and later import) your bookmarks which is useful if you’re due for a laptop refresh or just to have a list saved incase your computer crashes. She also discussed using session manager to save all of your tabs for a specific project. 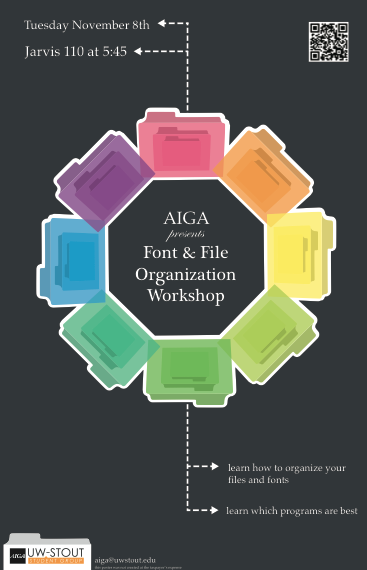 Next we talked about fonts and font organization. 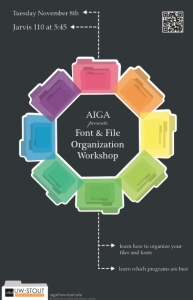 Many people use Font Book as a resource for organizing files because you can search for fonts you’ve downloaded and it is an easy way to activate/deactivate fonts to keep your computer running quickly. Fontsquirrel.com is a good resource for downloading fonts because they are all free to use. We also talked about www.wordmark.it as a way to search through your fonts if you have something specific in mind. A method most of us use to organize our files is to create a folder for each class and then folders within that for each specific project. In the project folder we keep inspiration, working files, finals, etc. It is always better to keep too many files than not enough. Keep “saving as” so that you have copies in case something goes wrong with one. Also converting your fonts to outlines is a good idea incase you loose the font that you used on a project when transferring to another computer, etc. but also keep a copy of the text that isn’t converted to outlines off of the artboard so that you can easily make changes, if necessary. Using the “places” section within Finder is really helpful for quickly accessing current projects. When backing up color coding is a good idea to keep everything organized and easy to find. Archive your school things by semester and year, class, project, etc. Also back up itunes, photos, and keep freelance work separate from school so that it’s easier to find, and all in one place. It is especially important to make sure these freelance files are backed up so that you don’t end up looking unprofessional in front of a client if something goes wrong. It’s also a good idea to save these files in multiple places. There are a few resources that are really great for backing up files online. This is a great way to make sure that your files can be found in at least ONE place if something were to happen to your computer. As students, we have access to the Blue Drive. Dropbox is another great option and is really easy to use. This is just a brief overview of the meeting last week so if you have questions about specific things feel free to ask a board member! Last Tuesday we were fortunate enough to have designer Matthew Rezac as our guest speaker. He is originally from South Dakota and moved to Minneapolis in 1998 to go to MCAD. He graduated with a BFA in Photography and after pursuing a career in freelance photography, realized he hated it. He went back to MCAD for more graphic design courses. After graduating again, he worked at MCAD where he did some design work for some non-profit organizations as well as helped rebrand the school. 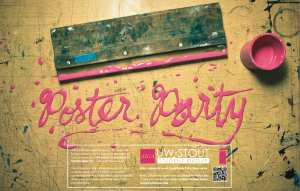 He also worked for two years at the Walker Art Center with their fellowship program. He now is a freelance graphic designer. He works on smaller projects for gallery openings, catalogs, web-based projects and also some identity and branding projects. He likes this quote and lives by it because he says he doesn’t have a certain design style but claims to have a “design approach” instead because each project is unique and requires something different. See more about these projects and many others at Matt’s website.